Beach sports are currently taking the world by storm and are growing in popularity year on year. Everybody’s heard of beach volleyball through the Olympics but there are many other beach sports out there that are just as fast and just as fun. Get involved and take your pick from beach soccer, beach footvolley, beach cricket, beach tennis and even beach rugby. Everyone of them is incredible for your fitness levels because of the extra exertion required from moving through the sand. You can expect beach sports players to be supremely fit. In fact even the most elite beach soccer players will be rested throughout the game to keep on top of their energy levels. We ran England Beach Soccer from 2001 to 2012 and in this time learnt a lot about the benefits of beach sports and fell in love with them. The UK can and does excel in theses sports even in our climate but we need more permanent sand court facilities for our athletes to train in winter to be able to compete worldwide . We built the Olympic Legacy sand sports courts around London in 2012/13 and from here a thriving beach volleyball scene has developed , see -londonbeachvolleyball.org. A quick search online will help you find many other beach sports scenes that have developed all over the country or ask your local council. Get involved in the UK’s most exciting sports scene and get beach fit. See you on the sand…..
Beach weddings are a dream for many of us but the thought of packing everyone off to the other side of the world is sometimes overwhelming. So the solution, build your very own urban beach anywhere you like, indoor or outdoor, and create your very own sandy haven from which to get wed or celebrate the best day of your life! With creative back drops, screens, beach props, authentic tiki bars and the sand trickling through your toes, you can create your perfect dream beach right here at home. Urban beach party for Red Bull at Woburn Abbey. 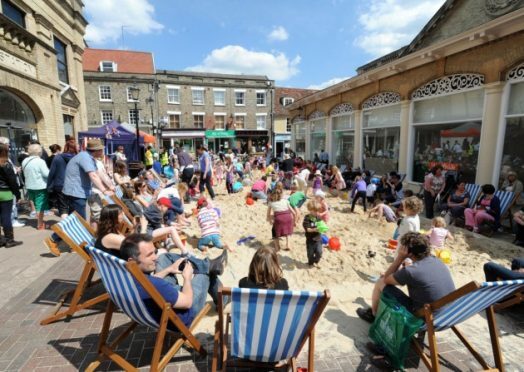 The town might be more than 70 miles from the nearest beach, but for three weeks in August this summer the BID’s ever popular Beach was built on the Market Square. The beach opened on 6 August and ran until 27 August from 10am until 4pm and was even bigger and better than previous years. As well as a lovely sandy beach with buckets and spades for the children, deckchairs for the parents and music for all, there was a Helter Skelter and aqua boats and swing boats, Punch & Judy shows, a photo wall, cake sales, tombola and more! All in all, a beach designed to make sandy young visitors very happy! SAMBA music and carnival fever made its way to the borough of Solihull this summer at Touchwood Shopping Centres “Touch of Rio” themed beach. Lovely sandy urban beach build at Priory Meadows Shopping Centre in Hastings. We don’t just do sand. Astro is sometimes the only way to go…. Life’s a Beach at Lee Valley this year. Visitors to Lee Valley Country Park can now relax on the parks very own permanent urban beach, which is situated by the Olympic white water rafting course. 140 tonnes of golden sands were shipped in to transform the area by the Pavillion into a glorious sandy haven for chilling out and having fun with the kids. Lee Valley already offers an incredible array of outdoor activities and places to visit including watersports, cycling, climbing and even glamping in mini wooden cabins and cocoons. Surely we need one of these in the UK? The rain hasn’t stopped people in Swansea having fun on the beach – thanks to the Quadrant Shopping Centre. An eight metre by four metre stretch of golden sand has appeared at the centre and children have been making the most of it this week even as the skies outside have darkened. Among those having a great time building sandcastles on the indoor beach have been cousins Jake, four, and Ellis Richards, two, who were there with their grandmother, Gloria Richards, from Fforestfach, Swansea. She said: “They’re having a lovely time and really enjoying it. There are loads here, about 20 little ones all playing in the sand. Sarah Temple, from Swansea’s Penlan, has been there this week with her son Danny, eight, and her niece and nephew, Taylor, eight, and Rowan, nearly two. She said: “It was nice to have a coffee in peace today while they were busy in the sand. Quadrant Shopping Centre deputy manager Lindy Emms said of the new arrival: “The weather has been a bit miserable outside but in here the children have been having a lovely time. The indoor beach has been provided by Beach Events who were involved in installing the 2012 London Olympics Beach Volleyball courts. And the company has built “urban beaches” all over the country. (c) Beach-Events and Solutions LTD. 2012: Permanent, Temporary, Urban Beach Build Sports Beach builds, Festival Beach build Specialists.